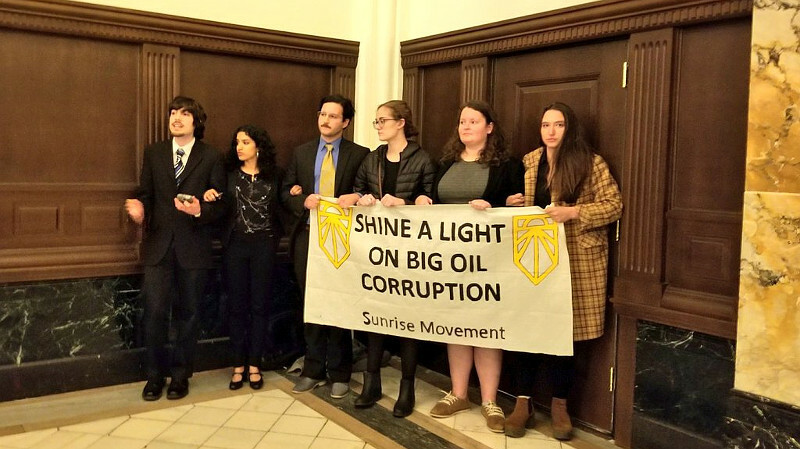 On the 5th of March, the Sunrise Movement sucessfully slipped past the defenses of Trump Hotel and blocked the entrances to a room where "IPAAaccess" planned to eat dinner while lobbying politicians to do their bidding. All got out safely after an hour-long blockade. IPAAaccess is a lobbying arm of the Independent Petroleum Institute of America, and the purpose of the dinner was to promote fracking. Outside Trump Hotel, both Indigenous and non-Indigenous supporters held a support rally for the first hour. During this rally, the inside team's video livestreamer was expelled along with the rest of the support team. The action continued both inside and out, with twelve youth blockading the room while protesters sang songs outside. Finally, all twelve heroes of the blockade were safely escorted out of the building, possibly to evade ugly press attention flowing from arrests inside Trump Hotel at this sort of event. This blockade shut down the IPAAaccess event for at least an hour, and one of the folks kicked out early with the photo and video crew reported the oil lobbyists "kind of crabby that their meeting got cancelled." This is a successful de-platforming of a pro-fracking oil industry lobbying event inside Trump's own semi-fortified hotel. The use of Trump Hotel for an oil industry lobbying dinner shows how corporations and the Trump regime are working hand in hand to dismantle almost all environmental protections. The lockstep relationship between government and industry we see under Trump is every bit as much an element of fascism as racism and centralized power is. Mussolini himself said "fascism should really be called corporatism"
Since the dawn of the blatently racist and militantly pro-corporate Trump administration, civil disobedience has risen to a crescendo on Turtle Island. The action inside Trump Hotel came the same day as a march by DREAMers on Democratic Party headquarters condemning the Dems for throwing them under the bus. That action ended in arrests. Some thought the police brutality and extreme prosecutions meted out (and still being meted out to 59 J20 defendents) in the first days of Trump's regime would put an end to civil disobedience, but it seems to have had the opposite effect. With some activists threatened with prison for the rest of their lives, others have stepped up to the plate in a really big way. This is how resistance to a facist regime is sustained: for every rebel the Empire manages murder or imprison, a dozen more arise in his or her place. This was only the third successful protest inside Trump Hotel in this author's memory. One of the others was a pro DREAM act protest inside Trump Hotel on September 6. That was the day after Trump unilaterally revoked DACA. The other and first was the Million Mask March's succesful storming of Trump Hotel just days before the Nov 2016 election.